The Gorilla is a shy creature of the African Jungle. The regal, powerful head illustrates the robust power he posseses. The eyes reflects his peaceful nature. 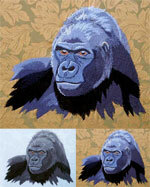 Frames: This Gorilla Embroidery Portrait is ready to hang on the wall!